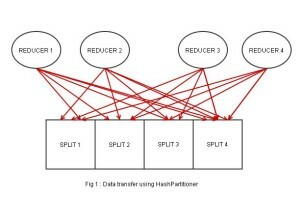 When you are setting up a Hadoop job to process a large dataset and write into an Accumulo table, there’s data transfer between the reducers and Accumulo TabletServers, which then adds the key value pairs to the appropriate tablet. 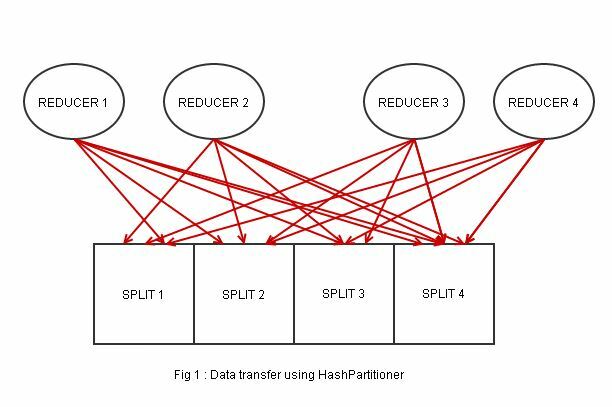 Now, as mentioned earlier, if you don’t specify any partitioner class in the job configuration, Hadoop will use the HashPartitioner to partition your data and you would have your data spread into a number of reducers, sorted by the hash value. However, citing the Accumulo User Manual, Accumulo tables are partitioned into tablets consisting a set of key value pairs, sorted lexicographically in ascending order. 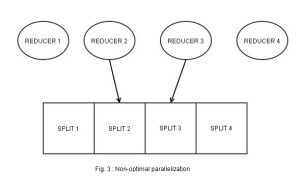 Comparing the two, we can intuitively say that the reducer and Accumulo have 2 different sorting methods. By using HashPartitioner, one reducer ends up containing different key values for every tablets, and each key value pair needs to undergo another “checking” before it is sent to the appropriate tablet (Fig. 1). This would cost you a lot of time and your reduce-slots will probably congest single tablets, slowing down ingestion. 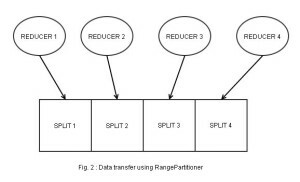 As with RangePartitioner, on the other hand, you could ensure that during the MapReduce job, the data are partitioned the same way as in Accumulo, so each reducer ends up with only key-value pairs for each tablet (Fig. 2). 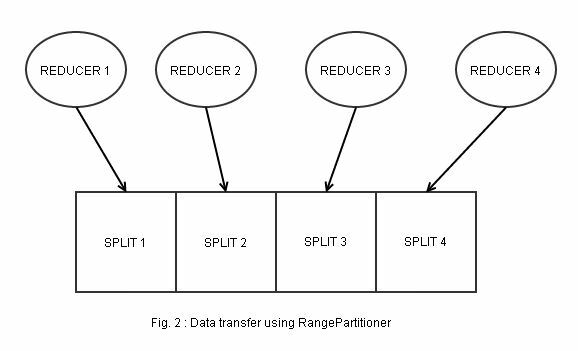 Using a RangePartitioner can increase your data ingest rate, but be aware of your data distribution. 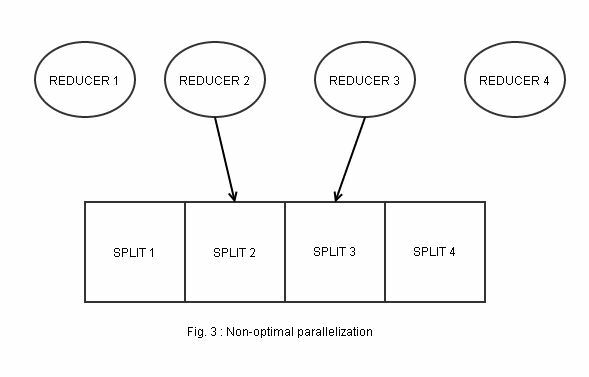 If your data is distributed very unevenly you might end up with a lot of Reducers doing almost nothing and very few reducers doing all the work, killing the parallelism in your job and driving your ingestion rate down (Fig. 3). In that case, HashPartioner might be a better choice. Hint: If you take a look at the source code of RangePartitioner.setSplitsFile() you will notice that the file path is added to the job configuration and the file is added to the distributed cache. Since RangePartioner requires some custom action to create an up-to-date splits file and determine the current number of splits, you will need a custom java action in your oozie workflow before the actual mapreduce action can be executed. From within your Java Action you can use “capture-output” and (see this blog post for futher details).